What is an Uninterruptible Power Supply (UPS), do you need one, and if so how do you decide what you need? At its most elemental level a UPS is simply a charged battery that delivers enough power to your computer, and other critical hardware such as a monitor, to save and close current files and properly shut down the operating system when the primary power source has failed, such as in a blackout. The answers to the second and third questions depend on how you use your Mac and on your hardware requirements, but there are some basic principles that will be covered in this article to hopefully get you on the right track. I will not be telling you which type of UPS, or even which UPS brand to buy. After reading this you should be somewhat more informed, or at least have a head start on where to go for additional research. Have you ever been sitting in front of your monitor, immersed in whatever creative process you happen to subscribe to, and failed to save those ever-so-clever adjustments to a file when the lights went out? It feels like you can never quite get it back to the way it was, right? I bet you wish you had a UPS. If your desktop Mac activities would involve the loss of irreplaceable mission critical information in a power outage, such as in any business environment, then you definitely need at least a UPS if not a UPS/back-up generator combination depending on the scale of your system or network. Even if you use your Mac at home for more recreational pursuits and already have a good (not cheap) surge protector, you may still suffer hardware damage or lose valuable files if power to the drive is interrupted while, say, updating your operating system or simply moving some family photos from your camera. If you have a laptop then you already have a built-in battery, but there are still many advantages to using a UPS, such as power conditioning. Businessweek.com cites a 2004 survey by Emerson Network Power that reports 75% of small business owners feel power outages are a threat to their venture, yet 62% still do not have a backup power supply. The same study also found that of the 80% who have experienced power outages, over 14% reported that their longest outage cost $5,000 or more. While there are several preventive strategies for avoiding the problems brought about by power outages, such as regular data backups and generators, this article is about the immediate first line of defense provided by the UPS. I will describe my UPS experiences with desktop Macs, and then try to be informative, yet brief, about how to determine your requirements and choices in the market. After shelling out the big bucks for a G5 Quad Power Mac, I decided that a UPS was in order since I was starting to work from home on 3D graphics and animations and didn’t want to lose important file changes or renders in mid-run because of power failures. Contrary to my normal routine of research first, I went down to one of the local big box retailers to browse the UPS selection—after all, how complex could it be, right? I read the box literature describing connected equipment warranties, VA capacity, output waveform, and backup capabilities etc., etc. In the end I picked up the largest one available in the store to give it a try, a Belkin Enterprise 1200VA (currently discontinued). In defense of my actions, this UPS was listed on the box as “ideal” for Power Mac G5 processors. I quickly found out that I had some misconceptions about what this UPS could do for me and my G5 Quad. For instance, the purported battery power supply of up to 100 minutes for the 1200VA actually provided less than 10 minutes for me with only a 19 inch LCD monitor as additional peripheral hardware. Obviously the Quad was no ordinary computer. I knew that, but just how much of a power-hungry beast it was surprised me. It became apparent after my post-purchase research that if I wanted a longer battery charge to finish off big renders then I would have to pay big bucks beyond my post-Quad budget and meager supplementary income from the graphics work. 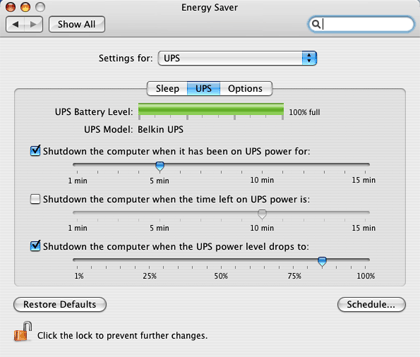 The Mac OS X UPS settings, found in the Energy Saver pane in System Preferences. However, I received a real shock (figuratively, not literally) when we had a power failure a few weeks later and the Quad was in sleep mode. I had the Mac OS X UPS settings, found in System Preferences ‣ Energy Saver ‣ Settings pop-up menu, set to shut down the computer after only a few minutes of battery power since I knew the 1200VA could not handle much more than that. But nothing happened! I checked to make sure the USB cord was connected to the UPS and computer, and it was, so I went to wake it manually to shut down properly. That’s when all hell broke loose: all nine cooling fans went supernova, the red warning light came on inside the front grill for the power supply, and the monitor was black. I had never experienced anything like this before, and in my adrenaline-enhanced state thought the Quad was going to blow something very expensive to replace. I quickly pushed and held down the main power switch for a hard shut down. There was nothing else to do. The same thing happened two other times during power failures. I did a bit of digging here and there, and I found that peak power requirements at startup, or waking, exceeded the capacity of my UPS. However, nobody could tell me how much power the Quad needed at these critical times, since all computer data I could find states normal operational requirements. Flash forward to Fall 2006. I sold my G5 Quad (never could stomach the knowledge that the liquid cooling system sat above the power supply) and purchased a 2.66 GHz Mac Pro. Perhaps it was fate, as the power went off with the Mac Pro in sleep mode a few weeks later, so I got up to see what was going to happen this time. Again, the OS X UPS shutdown settings did not activate when in sleep mode, so I had to wake the unit to shut down properly. To my surprise it powered up normally, but I didn’t have the monitor plugged into backup UPS power, so I had no screen, and subsequently plugging the monitor into backup power did not result in a video connection for whatever reason. I was half-awake so I instinctively pushed the main power switch for a hard shut down, but failed to hold it down long enough this time, so it just went to sleep again. I can laugh now, but I wasn’t very happy with myself at that moment, and instead of just trying a hard shut down from sleep I ended up waking the computer again. To my utter amazement, the Mac Pro woke from sleep a second time on UPS battery power with no problem! I had read that the power efficiency of the Intel-chipped Macs was a vast improvement over the G5s, and here was first-hand proof. There are a plethora of Web sites that provide detailed information and schematic diagrams of the various types of UPSs, so I will not go into too much detail. Readers requiring more information should consult the Pacific Gas and Electrical Company article, or the BC Hydro UPS Guide, as I found these very comprehensive and concise. PC Guide provides an insightful table comparing the different types of UPS and other protection offerings versus some common power problems, and you should look at it if you are making a decision to buy a certain type of UPS. The Holy Grail of online UPS FAQ links can be found at JetCafe and I highly recommend that you print this document and save it for reference. While there is some variation within each type, in a nutshell, there are three varieties of UPSs: Standby (or offline), Line Interactive, and Online. Each contains a battery, an AC-DC battery charger or rectifier, and a DC-AC inverter to take battery power and provide it in a useful form for your computer. A Standby UPS provides main AC power directly from the wall socket to the computer, but in the event of an outage a transfer switch activates the secondary battery circuit. This results in a 1 to 5 millisecond power interruption, which is at the tolerance limit of a typical computer power unit. These are the least expensive of the UPSs. Line Interactive UPSs also rely on main AC power for the computer during normal operation, but have a bi-directional charger/inverter. When power fails, the bi-directional unit switches to inverter mode to provide battery power. Since the charger/inverter is functionally always on, switching times are minimized compared to standby UPSs. The efficiency of these units is between 90 to 96%. Online UPSs convert all the main AC power to DC, and then convert it all back to AC power before it is supplied to your computer. Thus it is always in the same operating mode so there are no power interruptions. In this way they also effectively filter line noise and other power anomalies, but at a cost. Efficiency is reduced to 80 to 90% with heat as a bi-product. These units are typically the most expensive. I must first say that the following information is provided at your own risk, and geared to a North American audience with standard 120-volt AC current. If you live elsewhere, you should find out how your electricity is delivered to your computer and adjust accordingly. If after completing some of the calculations below you find you need a UPS bigger than say a 2,000 to 3,000VA, and you’re not an electrical engineer, then I would get some professional advice. Optimizing your UPS purchase to suit your needs and budget is not a simple process for the uninitiated. They are usually rated in volt-amperes (VA), but the manufacturer should also state a maximum wattage for connected hardware. While you may be tempted to get a grossly over-sized UPS relative to your needs, be aware that these systems typically function most efficiently near their rated capacity. That said, an over-sized UPS will deliver longer battery power in the clinch of an outage, but you should really weigh the cost/benefit of a big UPS versus the simple purchase of a laptop, which will offer much longer work time on its battery during a power outage. For those who want a simple just-tell-me-the-bottom-line answer for their UPS needs, American Power Conversion (APC) has a nifty UPS selector that yields three product recommendations (all of them APC, of course) listing them as: best price, best value, and best performance. If nothing else it provides one with a rough idea of what VA range you need to be looking for. Generally speaking, the VA output rating of the UPS should exceed the load by at least 50% to 100%, so how do you calculate your expected load? The link to BC Hydro’s UPS Guide contains a six-step worksheet using hardware wattage to help determine a UPS for your needs. Very briefly, you simply obtain the wattage of all devices to be connected, bearing in mind that printers are energy hogs and should not be operated on battery backup ever, and then compare this to the total wattage listed by the UPS manufacturer. This will get you into the ballpark area of your UPS needs. However, the UPS VA rating is not the same as power drain, measured in watts, from the hardware. Some literature suggests a conservative factor of Watts × 1.6=VA, while others list VA × 0.85 to 0.7=Watts. There is no way to accurately know without actually measuring the draw of your hardware with an ammeter. So where does that leave the electronically challenged? As mentioned in the JetCafe link, obtaining a UPS whose VA is equal or greater than the total electric load rating of all hardware will err on the side of caution, and be properly conservative. An additional purchase consideration is that the batteries in a UPS have a limited life span, so you must expect to either replace the unit in a few years or plan ahead and purchase a UPS with the capability to replace the battery packs. Contrary to what you may read in some Belkin UPS reviews, I have discovered that the batteries in most of their models can be replaced either at source or that my 1200VA model can even use upgraded 1500VA replacement battery packs for the APC brand UPSs, though I would never recommend anyone to do this. Third-party reviews of UPS backup software run the gamut, but the majority opinion from real folks using it is that most of it isn’t that easy to use, so don’t let it factor into your purchase decision too much. Think about it this way: get a good UPS that will give you plenty of time to save what you’re working on before shutting down, and never walk away from your machine without saving. If your Mac is running something that cannot be stopped without loss, such as my 3D renders which must run to completion, then bite the bullet and either get a higher end backup power solution, or just re-render when the power is back on. As with any piece of equipment, read the manufacturer’s manual before you start plugging things into your UPS. A typical UPS out of the box will require several hours to a day to charge the batteries. Give them the time for a full charge before you start using it. Extension cords are not recommended as they unnecessarily increase resistance, and while this sounds like a no-brainer, never put a surge protector between a UPS and a computer. And again, don’t plug a printer into the backup supply socket from a UPS since they draw too much power. Dust-clogged UPS air ventilation slots and high(er) room temperatures can have an adverse effect on battery life. Another point from my list of personal misperceptions: the UPS’s batteries are not like other rechargeable batteries since they do not have a “battery memory” or experience longer life if you discharge them regularly. In fact, they lose capacity with each deep draw on their reserves. And oh, one last thing: you should be aware that there is enough juice in one of these things to kill somebody, so don’t fool around inside it if you don’t know what you’re doing, and if you’re reading this then you don’t know what you’re doing. Make your UPS purchase based on a conservative determination of VA requirements, or a total wattage calculation if have to, with more capacity thrown in to accommodate hardware upgrades within the next few years if it is within your current UPS budget. Take the unit home and see if you can wake your computer from sleep when it is on UPS battery power, since I think this is an important issue that I have not seen mentioned anywhere in the UPS literature. In addition, I have not found an answer to why the UPS shutdown settings in the Energy Saver pane of System Preferences in OS X are not activated when the computer is in sleep mode. If anyone has a solution, please let all of us know. Copyright © 2007 Chris Dudar, PhD. You should have used a 1500VA UPS for the Quad G5. FYI for other Quad G5 users. I have a Belkin 1500VA for my dual g5 and 30" monitor and smaller items. I'd like to add that Belkin offers longer warranty than APC. Also make note that you want a UPS with USB connection so your modern Mac can connect to it to monitor the status. APC's PowerChute PE is less useful compared to Sentry Bulldog from Belkin which can show you your load level and other real-time info. You could have also mentioned the line interactive or AVR feature found on the better standby UPSs to help boost power during brownouts without switching to the battery. Bradley, have you tried to wake your Quad G5 computer from sleep on UPS power? I would like to know if my experience is unique... As far as 1200VA verses 1500VA for the Quad, advice given to me by people who should know (electrical engineers) actually recommended a 2000VA for the Quad G5, but perhaps that was too overly conservative (?). As I stated above, I have a Dual, not a Quad G5. Anyway, I have not had to wake it while under battery power. Only thing I can tell you is with the dual, I'm at 34% load while running. Can't tell you load while starting or waking. According to specs, it can pull 10A at 125V, so a 1250VA unit would be minimal, not including a monitor. A safe engineering practice is to double the capacity to lengthen the life of the battery and lessen the wear on the UPS, so I can see where a 2KVA unit would be suggested, but they get pricey above 1.5KVA. I know another user with a 1.5KVA UPS and a Quad and no reports of problems, but then again his power is pretty good most of the time and hasn't tested this situation. There is a thread from macosxhints that suggests a 2.2KVA unit is required to avoid tripping a UPS at wakeup which would cause the G5 to shut down, bad timing it seems with the UPS being monitored via USB. The Mac gets a bit confused switching from UPS power to normal power as it wakes up. Either pull the USB cable so it doesn't get monitored or get the big APC Smart-UPS 2200VA units. Refurbished they are more than twice the price of a 1500VA. I've got an 1100VA Belkin unit on my Quad G5 w/ 23" Cinema Display - works fine. The thing is - you must ensure you're not overloading the UPS. Do not plug anything into the battery backup ports other than your system and the monitor. Plugging in a powerstrip which also feeds firewire drives, USB hubs, whatever is simply asking for trouble (particularly scanners). Finally, one annoying thing is the lack of software for UPS support. The Belkin software is crap, PowerGuardian is now dead, and there's basically no other solutions out there if your UPS is not supported by the OSX Energy Saver panel - like my Belkin, for example. Since you may have an outage when you are not home to wake the computer, why not just leave it on all the time. Install the Folding@Home software and at least by donating the CPU cycles to the project at Stanford at you are contributing to scientific research rather than just wasting electricity. What type of UPS do you recommend for a 24" Imac running Leopard? The power requirements are about half of the G5, so a 750 VA unit should be OK for a reasonable runtime. Belkin recently stopped selling their battery backups, but I see MacMall offers the 750VA Office Series for $100. It has 6 outlets with decent spacing for the computer, cable modem, router, external hard drive, and anything else that needs power during a glitch. printers and scanners need only a surge suppressor. There is also the APC BE750G for $80 but it lacks AVR. The Back-UPS RS 800 or BR800BLK is $143 They (APC) now offer 3 year warranty repair. Some people prefer APC as they offer a mix of 4 battery backed outlets and 3 surge-only. One each type has transformer spacing. Ken - Most of the decent UPS models will have a chart on the box indicating how long various computers will run on the device. APC is arguably one of the most reliable brands, and they do have the run-time chart. The ones I've seen include a column for iMacs. Therefore, which specific type you choose will depend on how long you want the UPS to be able to power your iMac in the event of an outage. Keep in mind that every added peripheral takes a bit away from that total run time. Also look at the configuration/location/number of the outlets, including how many tap the battery and how many are only for protection, but not battery backup. These plugs would be used for things like printers or any other device that doesn't need to be on battery backup. I see others have replied already, so I'll be brief. Really, the article was written and provides references for you to figure this out for yourself. Do not rely on someone else's advice (nothing against your advice Lee, you're pretty much re-iterating what is in the article) because many people think they know, but in fact know just enough to be dangerous. I fall into that second category more times than I care to admit. Your personal use will be unique. 1200VA could be ideal for a Power Mac G4, and marginal for a dual G5, but the quad G5 could trip up even a 2000VA unit as it wakes from sleep. Bradley - oh I dunno, I now run a Back-UPS XS 1500 on a Quad G5 at work that gives me about 17 minutes—just enough to finish what I'm doing and shut down. Granted, I'll probably go with a 2000VA when I finally get my Mac Pro at home. You're contradicting yourself. In your first comment in this article you say, "You should have used a 1500VA UPS for the Quad G5." I replied, "...advice given to me by people who should know (electrical engineers) actually recommended a 2000VA for the Quad G5." Now you say, "...but the quad G5 could trip up even a 2000VA unit as it wakes from sleep." This isn't revealing anything new to the body of this article or the discussion. I'll go with the electrical engineers.